have now had some full days of hiking in the marmot zion soft shell (with polartec's new waterproof & breathable membrane) now that the weather has cooled off. today was a great day for it - high 40's to low/mid 50s, steady light rain with bands of heavier rain mixed in. gained about 800 feet vertical in per hour for three hours, then turned around. wore the jacket over a light wool t shirt. unlike a hard shell, this has a little bit of a fuzzy backing to the fabric, so it's a little warmer than a hard shell. no armpit zips, so the only way you're venting is via the front zipper, or just relying on the shell to 'breathe.' on the other hand, the fabric is much more 'quiet' than any hard shell and more comfortable to move around in because it has some give/stretch to it. now, any time i hike up something this steep, i'm going to sweat, whether i have to wear a rain shell or not. today was no exception. the shell kept me completely dry from the rain, and while i was sweaty, i didn't at all feel damp inside - wool does a good job with that, but it just didn't get very damp because moisture was clearly getting out, and i had to keep it zipped up because i would have been pretty wet otherwise. i appreciated the outside fabric because i spent a lot of the day getting grabbed by branches, on a trail that isn't used much and has a lot of overhanging and intruding branches from the sides. no real concern about a soft shell getting snagged like a hard shell. the bottom line is that polartec's new waterproof/breathable membrane works well - as well as gore or eVent. in a soft shell jacket, which is notable. Mist and rain on my iphone lense ruined most of the photos yesterday. 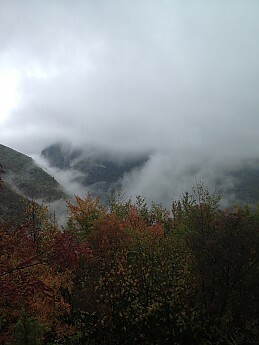 hiked into low cloud cover in the Rrugova mountains. This is within easy walking distance from the center of Peja, Kosovo. Good to know, but it's too expensive for my wallet.